You are here: Home » MEDIA » Books » Limit: Part 1 by Frank Schätzing (book review). Limit: Part 1 by Frank Schätzing (book review). 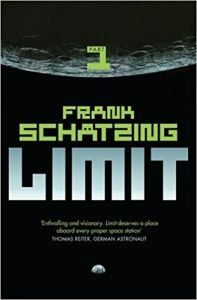 Originally published in German, ‘Limit’ is Frank Schätzing’s mammoth near-future thriller, translated into English in an equally unwieldy massive volume and then, thankfully, published by Jo Fletcher Books in a 2 volume edition. Even so, part 1 is 705 pages long which, I don’t know about you, but I find to be uncomfortably large to read with ease. You just can’t hold it easily in one hand while drinking a cup of tea. The story is set in 2025, which was 16 years in the future when first published, and faces the unenviable task common to all near-future stories of trying to make realistic projections of current and emerging technology while still being grounded in our own recognisable world. There’s quite an array of ideas thrown into the pot along the way: space elevators, orbital and lunar hotels, flying cars and bikes, automated urban transport systems and all kinds of other gadgets and gizmos. Of course, several years after the original publication, it’s much easier to see which of these ideas were over-optimistic, but that doesn’t really affect the realistic settings and characters that Frank Schätzing has woven together in this multi-stranded plot. The book straddles the line somewhere between near-future thriller and hard SF, but the style and tone overall came across more as a thriller than a Science Fiction book. Even though lots of the concepts are SFnal in nature, particularly space elevators and orbital hotels, these are not dealt with in the matter-of-fact way you would usually expect in a Science Fiction book where the reader comes with a certain amount of knowledge of such futuristic concepts and an expectation that this world is different to our own and certain assumptions will have to be made and understood to get the feel of the world. Frank Schätzing doesn’t leave any of this to chance, though, but explains all of the innovations and technologies as they appear, using two different techniques. The first and most unobtrusive is the way many of the gadgets and flying bikes and the like that appear in the Earth-based scenes are introduced. Much of the action takes place in Shanghai, where private detective Owen Jericho is searching for missing student and dissident hacker Yoyo. He is familiar with most of the innovations and, through his point of view we’re introduced to them, but mostly with the caveat that they are brand new, not available to most people or that he’s only seen prototypes before. For a hardened SF reader, like myself, this becomes slightly irritating that everything has to be explained away, almost patronisingly so. Owen Jericho is usually pretty brief with his explanations, so it doesn’t impact too much on the flow of the narrative. Jericho’s investigations are intriguing and often fast-paced as he wends his way through different sectors of Shanghai, coming up against Chinese customs and courtesies, visiting both slums and high-tech high rises, dipping into the worlds of on-line hackers, big business, biker gangs and skilled assassins. This whole plot thread, by the end of volume one, still appears completely divorced from the initially larger plot thread of the tourist trip to the Moon and Sino-American disagreements over lunar resources. I’m beginning to see where the connections might be but, as it stands, I would be happy to read the Owen Jericho story as a book in itself. The second technique Frank Schätzing uses to keep us informed regarding the technological inventions of his book is the old ploy of having a secondary character ask lots of dumb questions so the knowledgeable characters can explain everything and explain they do. A lot! Sometimes for several pages. The recent socio-political history of the world, the downfall of the petrochemical industry, the development of space flight and lunar bases, every bit of technology and equipment, the history of spaceflight and astronomy and other things that really didn’t seem to need explaining. All of this takes place during the trip by a number of multi-millionaire potential investors who visit first of all the tropical island paradise hotel near the base of the space elevator, the trip up in the elevator, the stay on the orbital hotel, the trip to the moon, the tour of the lunar hotel and finally their stay at the hotel. By page 200, nothing much had happened apart from the gradual progression of these tourists through these various stages while carrying out inane conversations and being informed about all of the aforementioned. I was getting really bored of them and glad of the breaks to visit Owen Jericho on Shanghai. By page 500, the tourists had arrived at the lunar hotel and some interesting things were beginning to happen there, too, that pointed to intrigue and conspiracy so that I no longer minded which story thread I was reading. The final 200 pages really pick up the pace as Owen Jericho tries to track down Yoyo and, in turn, both of them are hunted by assassins. As the volume comes to a conclusion, yet more revelations are made and additional characters introduced. Despite the somewhat slow start, I ended up not thinking of this as an overly-long book but as a fantastically involved story that still had plenty of developments awaiting my discovery. Fortunately, I have volume 2 waiting for me on the book shelf which I’m looking forward to delving into. « The End Of The World Running Club by Adrian J. Walker (book review).